Are you sick of my doggie yet? Rawr! Please click below for doggie rambling. Ok, so we finally captured the Butter Bat Dance™. This is her crazy gargoyle like behaviour that so enchanted me on first meeting. She does this when she’s excited and you’ve issued a command she either doesn’t understand (uh, like “sit” or come”) or doesn’t want to understand. I’m not sure which. This is her excited Butter Bat Dance™ she also does the slow-mo Butter Bat where she does the same crawl, but laughably slow. That’s if she’s really in trouble. In any case, moobie ONE & TWO, for your pleasure. And don’t fret about her pink belly, she’s still growing hair back from having her missing uterus confirmed! I have to say, the dog training is fun. She’s pretty responsive, and most problems she has I can lay down to our mistakes rather than hers. Our biggest hurdle currently is “come”… I can’t let her off leash much in the park until she can come every time, and certainly not when any other dogs are around. But we practice every day. So. After the meet-up Saturday I was unpacking the dolls. 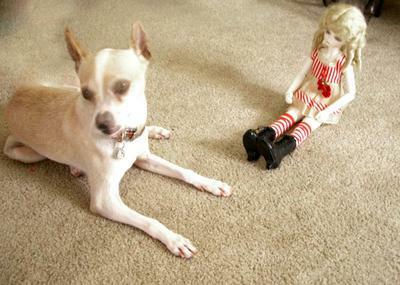 And Mr. Kallisti is wondering wistfully when the dog is finally gonna get her mouth on my dolls. Biscuit steals their wigs once in awhile, and knocks them over, but he doesn’t eat them or mangle anything. Butter, on the other hand, might find them fun to chew. One good point I found interesting about the Dog Whisperer is that when people bring new babies into the house you train the dog to be submissive to the baby. The baby is a pack leader and there will be no excitement or touching of the baby. The baby of course is completely passive in this exercise. So I thought… why wouldn’t this work with dolls! Imogen volunteered to be my bait, er… test subject. She’s quite the wrangler, and fierce to boot. We set her down near Butter and continually corrected her for touching and made her lie calmly by her, until she didn’t need to be corrected being near the doll. For something that started out as a bit of a joke, I think I’ll continue with the training. It might just save my dolls next time Biscuit knocks one off the doll stage to the (carpeted) floor! And an ugly flash pic. Butter has a boyfriend! My friend Laura moved close by, just on the Albany side of Creekside Park. She has a big dog named Gus. And she’s super with the animals and training and stuff. I’ve named her Butter’s godmother and Gus her boyfriend. Gus is the perfect dog. Big and lovable, super mellow and just magically does everything you say. Laura says he was not always like this, but he’s 7 I think and has mellowed with age. He’s a good example for her. So below are a couple pix of the two on their walk on Albany Hill. And also, I just wanna say, for the first time at the Pt. Isobel dog park Butter initiated play with two, count them, TWO small dogs yesterday. First a dachsund and then a teensy tiny yorkie. Both small dogs. She’s doing so well. No growlies. I’m so proud. LOL!! My little dog Sally(schnauzer mix) does a dance similiar when she’s excited &/or when I’m asking her to do something. And I know she knows what I’m asking of her. She tries to “cute” her way out of complying. Or she will go completely limp…..passive resistance. But if I have treats in my hand when I give her a compand she does everything I say. Go figger! oh she is Beautiful ! we have a crazy little dog too, they would so love each other i bet. Next Next post: Happy Birthday Biscuit!